[01:16:39] <SkinnypuppY34> Does EMC spilt the difference of backlash when closed and reopened? Having a problem getting my offsets to stay still b/t opening and closing. I have G54 @ 0,0 on DRO G55 @ x-2y2 G56 @ x2y2 G57 @ x2y-2 G58 @ x-2y-2 So there is something solid to compare to . [01:21:25] <SkinnypuppY34> It's easy enough to realign g54 by g1x1y1 and then touch off by whatever the dro value reads, is there a simpler way to keep these put ? [02:05:34] <fenn> does it only shift when you close emc after traveling in a certain direction? [02:20:26] <SkinnypuppY34> If I approach 0,0 from 1,1 and restart both axis will end up -.007 and -.008 if 0 is approached from x-1 y-1 then both will shift +.007 and +.008 my backlash is .014 and .016 in stepper_inch.ini so pretty much 1/2 B.L. [02:26:16] <SkinnypuppY34> 2.2.3 yes ? [02:30:21] <SkinnypuppY34> Using g92 after opening and g1x1y1 and g92 x1.007 y1.008 will synch up g54, but "show machine position" shows where I'm off by .007 .008 I'm guessing that machine position is what the other offsets are anchored to and how they are off too. Can I manipulate machine position? [02:56:40] <fenn> reexamine helix constraints. [03:04:12] <SkinnypuppY34> Ok thats verified that doing g1 x-.5 y-.5 , g1 x-.007 y-.008 before shutdown will give me a perfect g1 x1y1 upon restart and g55-59 line right back up . Wierd if it can keep up with what direction backlash was approached from last why does it split the difference on restart? [03:59:31] <fenn> what are you making? [04:07:45] <tomp> wedm talk, will you ruin it on compressed air or will you build a steam boiler? [04:10:01] <SkinnypuppY34> Air, I haven't done any boiler stuff as of yet. [04:10:32] <fenn> hmm for steam why not just go with an eccentric vane motor? [04:11:20] <SkinnypuppY34> I have a good bit of parts made up, and been working on some gcode to speed things up with in the future. [04:27:53] <SkinnypuppY34> THK KX Precision Ground is a pretty good ballscrew yes? Anyone using these ? [04:45:22] <fenn> what's that got to do with it? [04:50:38] <toastydeath> unless like, you produce ballscrew reviews for a living. [05:13:33] <fenn> what integrates force besides a compressible gas through a restricted orifice? [05:39:21] <eric_U> zat make it harder? [05:46:43] <eric_U> my wife is a psychiatrist at a large university, don't say things like that m'kay? [13:44:36] <skunkworks> Great work btw - your the first to try it. [14:05:27] <ALS> hey stepperschlag what type of config you get running? [14:14:21] <ALS> what size motors? [14:16:56] <ALS> what drives do you have? [18:45:27] <MASEngr> Good morning, everyone. [18:46:42] <MASEngr> I have a question about cutting out a photo. My boss wants to get a scanned image and cut it out with the CNC machine. [18:47:17] <bill20r3> uhm. I think you'd want a vinyl cutting plotter for that. [18:47:29] <bill20r3> or an exacto. [18:47:47] <MASEngr> Okay, let me rephrase that in a less stupid way. [18:48:26] <bill20r3> do you mean he wants it etched into metal? [18:48:39] <MASEngr> He wants the image on the photo to be traced onto the aluminum. I think he's looking at 2D. [18:48:47] <bill20r3> for a decorative plaque of some sort? [18:49:04] <MASEngr> I suppose so. It's probably a photo of his kids. [18:49:13] <bill20r3> if it were me, I'd try a trophy shop. [18:49:41] <bill20r3> or you could do a chemical etch, if copper(and maybe brass?) would be an acceptable substitute for aluminum. [18:50:03] <archivist> MASEngr, as an outline? [18:50:41] <MASEngr> Yeah, it's probably going to be an outline. [18:51:44] <MASEngr> Is there one that you'd recommend? [18:53:25] <MASEngr> Have you used bmp2cnc? [18:58:32] <MASEngr> Cool, I'll play with that and see how it works. [18:59:12] <MASEngr> Thanks for the OT help. I appreciate it. [19:09:55] <micges> have anyone know how beam shape correction can be done in EMC ? [19:11:16] <micges> someone ever try ? [19:25:23] <fenn> do you have any links to pages explaining the issues? [20:08:41] <skunkworks> you could scale the adaptive feed so 100% = max feed your machine could do. [20:18:29] <tomp2> can this work with gcode and the emc tp that is enforced by gcode? [20:18:30] <tomp2> I think xvel & yvel can be independantly scaled when using tiny vectors hal-streamed to hal but not with gcode. [20:21:09] <tomp2> right, cant chg both and stay on path doh! [20:27:41] <SWPLinux> micges: are you trying to change the milled shape? [20:28:49] <fenn> micges: how do you do different feeds in the same program then? [20:31:30] <SWPLinux> do you have rotation control over the laser? [20:31:59] <fenn> micges: the laser spot is a gaussian distribution right? [20:33:29] <skunkworks> SWPLinux: what he is hoping for is adjusting the adaptive feed on the fly depending on the direction(vector) the laser is cutting. [20:35:02] <SWPLinux> ok, so you want that in realtime, right? [20:37:35] <fenn> micges have you read about 'comp' yet? [20:40:08] <SWPLinux> low voltage differential transmission? [20:44:53] <SWPLinux> woohoo - found an outlet! [20:46:01] <fenn> does anyone know where the adaptive feed documentation is? [20:46:37] <SWPLinux> what kind of docs? how it works, how to connect it?? [20:50:15] <fenn> is feed_scale the same as feed override? [20:52:27] <fenn> did anyone ever get emc running on a wire edm? [20:55:56] <tomp2> clamp param beside limts of 0 to 1? [21:01:46] <fenn> heh "Bite me, spammers. Go ahead and harvest this. I use SpamAssassin; you lose." [21:18:44] <skunkworks> cradek: made it home ok? [21:46:45] <SWPLinux> tomp2: still around? [21:47:14] <F91> can someone point me to a good place to understand how to interface a servo motor? [21:47:58] <SWPLinux> or are you looking for general information like "the leg bone is connected to the ankle bone"? [21:48:52] <F91> but it isn't like a stepper which takes a step. [21:50:19] <F91> I am still reading other ones, but I know stepper can be done quickly with emc. [21:50:37] <F91> so let's say it is velocity for now, how I can use the parallel port? [21:51:21] <F91> can you give me a little bit more... PWM to generate a voltage or a frequency? [21:52:04] <F91> then the position is compute internally in emc? [21:52:50] <F91> humm. that's the part I get stuck. the controller is closing the loop in itself. so I can't get the information back to EMC. [21:54:05] <F91> I see... OK.
[21:54:12] <F91> let me think some more. [21:54:49] <F91> that's why I can confused when the doc said it can do servo. [21:55:31] <F91> how do I feedback? as a pulse? [21:55:38] <F91> I mean I do have IO left. [21:55:44] <F91> but voltage doesn't mean much. [21:55:54] <skunkworks> what are you using? printer port? [21:56:09] <F91> donated motor that has been sitting here for a while. [21:56:55] <F91> I am doing one drive only, so I should have some IO pin left. [21:57:27] <F91> yeah, the controller has closeloop in itself... that's why I can figure out "who is the boss"? [21:57:48] <F91> I see I see. [21:57:51] <F91> let me think some more. [21:58:11] <F91> I am using only one for now.. but I like to use it on 4 axis. [21:58:29] <F91> but I need to do more homeowkr. [21:58:44] <F91> thanks for the info! if it get's too hard, I'll buy stepper. [21:59:25] <SWPLinux> tomp2: you did a lot of the pyvcp work, right? [21:59:29] <F91> true. I am considering a 2nd PCI parallel card already. [22:01:51] <F91> that's why I need to check out EMC first, to make sure I have the right kind of command. [22:02:26] <F91> but it looks like it is goign to be hard. [22:03:31] <F91> I'll go do some homewokr now. [22:03:39] <F91> that's for the link skunkworks! [22:06:32] <fenn> eh? can't you just linksp twice? [22:11:14] <fenn> could you have a 'pass thru' fake parport so you could use it in a running config as well? [22:11:16] <SWPLinux> notice how the inputs label is right-justified in the table? [22:11:39] <SWPLinux> fenn: I'm not sure why - so you could see the parport pins? [22:18:36] <SWPLinux> can you just use the <-- blah> format? [22:24:37] <SWPLinux> I wonder if it makes sense anywhere else to have an "inverted-output" option for the button and checkbutton? [22:40:20] <tomp2> you woint find all direction possible in hbox or vbox, this was a stumbler for me & i went off trying to rewrite pyvcp. 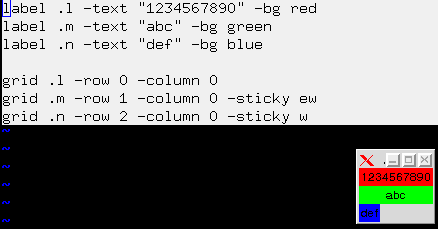 [22:51:15] <jepler> if .m was something without a distinctive background color, and it naturally placed its data at the left of its allocated space, then it would be hard to tell the difference between "e" and "ew"
[22:51:48] <SWPLinux> is it equivalent to center? [23:25:32] <micges> is this correct ? [23:27:02] <micges> It worked when in name of pin there wasnt any "-"
[23:32:10] <micges> linuxcnc wiki has area to put some images with algorithms to make something ?